Just before the holidays, PANTONE announced their Color of the Year Selection for 2016, which resulted in a first for the color authority: a blending of two shades. Rose Quartz and Serenity, paired side-by-side, suggest a calming union that signifies a sense of connectedness and mindfulness through color. 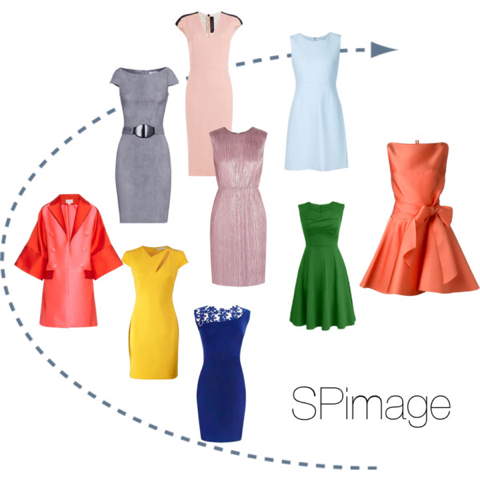 So, how does this blended color affect your clients’ wardrobe planning in Spring 2016? Chances are, you’re already getting comfortable with the color. If you’re an Apple fan, you’ve already witnessed the incredible popularity of the Rose Gold iPhone 6S, which Apple re-used for its launch of the smaller MacBook laptop last year. Very similar color shades are popping up on sweaters, pens, eye make-up – and nearly everywhere it seems to scream SPRING! Once you’ve determined your client’s optimal color palette, consider the Rose Quartz and Serenity as best for those with a Soft Palette, or those with Cool Palette (our Pocket Color Compass –Steps To Your Best Coloring book can help you do this). Darker shades and combinations of the two colors may provide attractive options for nearly all palettes’, especially for ladies’ pants, skirts, accessories (think scarves, gloves, glasses), and gifts this year as well. So keep your eyes open for Rose Quartz and Serenity, but bear in mind that these are trendy colors (truly of the moment)and may not be best for your skin tone or that of your clients. Here, we chose the top nine colors for you to try on next time you shop. Send us a photo or video, and let us know how these shades work for you! Courtesy: Lost on us all? 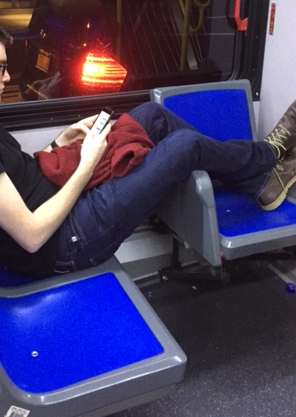 Taking the bus to midtown New York the other day, I noticed a couple of younger folks with their feet draped over the seats in front of me. The bus was relatively empty, but being completely engrossed in their phones, and the feet people weren’t aware that soon the extra multiple seats they were taking would soon be needed. 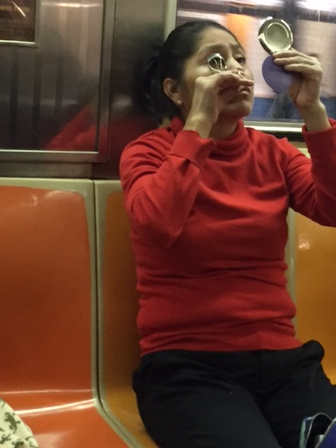 A week later, on the 4 train to downtown, I noticed a woman applying a full face of makeup on the train. She was quick – between the grand central and 14th Street, she was able to go from “ready” to “glam”. But the entire episode wasn’t glamorous; she was on a subway, grooming next to people who would sit in her same seat hundreds of times before the next train cleaning. Keeping your personal space needs to a minimum in a public place seems to be the most basic of courtesies; even the NYC Metropolitan Transit Authority (@MTA) agrees! Is it ever acceptable to lower your courtesy standard? How do you deal with people who are less than courteous where you live?